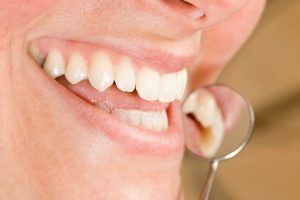 Why Choose Tooth Colored Fillings in Boston? For restoring cavities or repairing minor dental damage, tooth colored composite restorations provide an alternative to silver, or amalgam, fillings. They are natural-looking, sturdy, and require less removal of natural tooth structure. An excellent option for patients of all ages, your dentists at Kraft & Schrott Dental Associates provide tooth colored fillings in Boston. Compared to silver fillings, the advantages of tooth colored composite restorations are numerous and go beyond the fact that they are more aesthetically pleasing. In addition to blending with the surrounding enamel, tooth colored fillings require less removal of tooth structure and serve as a better insulator to temperature changes consequently causing less sensitivity to hot and cold. Composite resins are made of a mixture of smooth glass and plastic particles. Unlike amalgam fillings, these composite materials actually bond with the surface of the tooth. Amalgam, on the other hand, is merely applied into the cavity. With their ability to bond to tooth structure, tooth colored fillings make the tooth more sturdy and resistant to fractures than their silver counterparts. The Food and Drug Administration (FDA) has ruled the use of amalgam as safe in dentistry. Many patients, however, are increasingly concerned with the potential risks of mercury exposure from silver fillings and may opt to have existing amalgam fillings replaced with tooth colored fillings. The same material that fills cavities can also correct minor cosmetic flaws. Teeth that are slightly gapped, chipped, broken, or stained can be sculpted and repaired with composite restorations. To make cosmetic improvements using composite resin, your dentist slightly etches the surface of the tooth to help the material bond securely with tooth enamel. The composite resin is then placed and artfully sculpted directly onto the tooth. Once the tooth (or teeth) look just right, the material is cured within a matter of seconds. If you would like to discuss your options for tooth colored fillings, filling replacement, or cosmetic bonding, please get in touch with your dentist in Boston Kraft & Schrott Dental Associates. Request an appointment today! Comments Off on Why Choose Tooth Colored Fillings in Boston?